You see all kinds of strange things happening inside of cars. People who are naked. Halloween or Gay Pride Day is a great time to work because of all the costumes. You smell a lot of marijuana smoke, especially since Prop. 215 (medical marijuana initiative) passed. They smoke it right in front of you like it's no big deal. 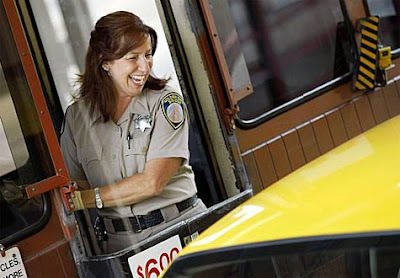 Nice look at the life of a toll collector on the Golden Gate Bridge. Sure was nice coming back here and seeing a smile!